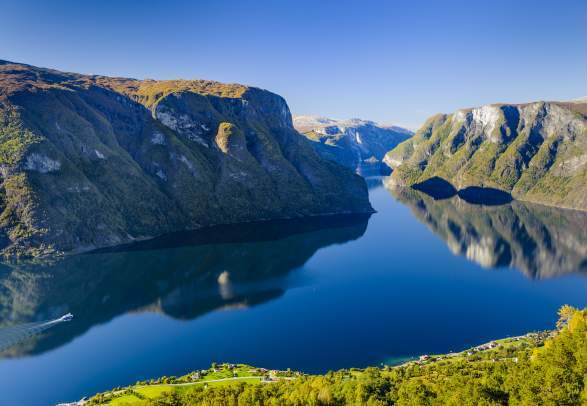 With more than 1,000 fjords around the country, 10 of which are frequented regularly by cruise ships, it’s not surprising that tourists wonder where to go and which fjords to see. Learn how to differentiate the most famous ones with the help of our fjord-wise guide Øyvind Heen. “Fjord is a Norwegian word gone international". Øyvind grew up by a fjord and has been exploring these unusual landscapes practically all his life, documenting them in texts and pictures by hiking, climbing, kayaking, and other ways of moving around. “I understand why visitors to Fjord Norway are confused. Not only are there so many fjords, they are also long and deep and have numerous side arms. To add to the confusion, some of the branches are far more famous than the main fjords”, Heen states. According to Heen, the most dramatic fjords are in fact such side arms: The Geirangerfjord, the Aurlandsfjord, the Nærøyfjord, and the Lysefjord. 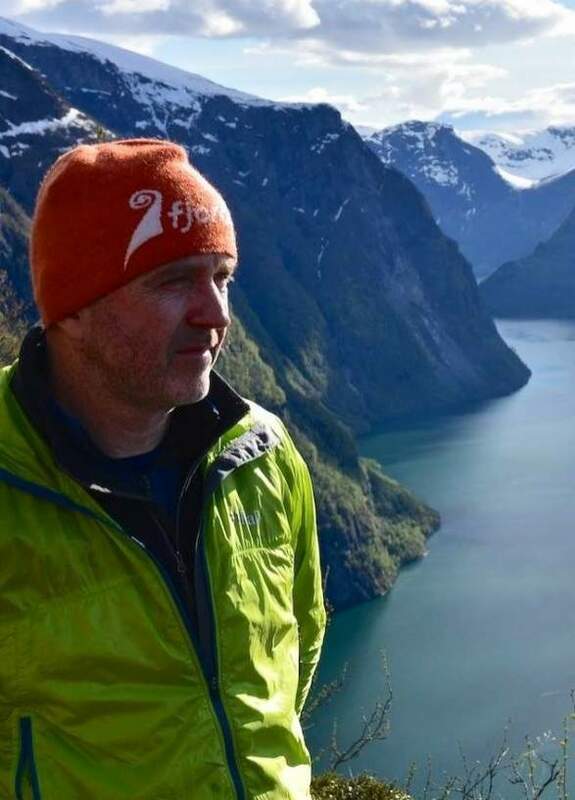 His list of fjords worth visiting also include the Romsdalsfjord, the Nordfjord, the Sognefjord, the Hardangerfjord, and the northerly narrow Trollfjord. “‘Fjord’ is a Norwegian word that has gone international. It’s an ancient Viking term related to the phrase for ‘where you travel across’ (der man ferder over) and the word ‘ferry’ (ferje)”, Heen tells. Think of Norway’s fjords as main roads with side streets and narrow back alleys – a bit like the canals of Venice gone XXL. And by the way – many tourists are fascinated by the changing weather conditions of the fjord landscape. “For those who come from warm and sunny places, the weather is an attraction in itself”, Heen claims. He himself plans to explore even more of the fjord universe that was engraved in him so long ago. 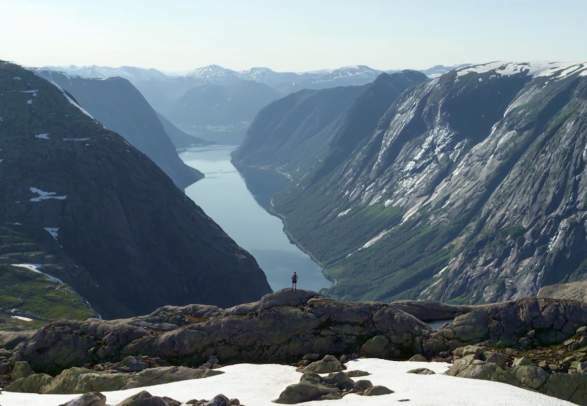 Below, he gives a quick guide to Norway’s major fjords from south to north.
. They can be reached on a day trip from the nearby city of Stavanger. , partly due to the incredible springtime flourishing of an abundance of hillside apple trees. Its most important and longest side arms are the Sørfjord and the Eidfjord, and it is lined with historic industrial towns like Odda. and has several elements in common with the Geirangerfjord. For example, it has a passage that is much narrower (only about 250 metres in some places) than its sources the Aurlandsfjord and the Sognefjord, and it is surrounded by steep mountainsides and flowing waterfalls. In the middle of this dramatic scenery you can see small, traditional farms and other dwellings in the hillsides along the fjord. and has several elements in common with the Geirangerfjord. 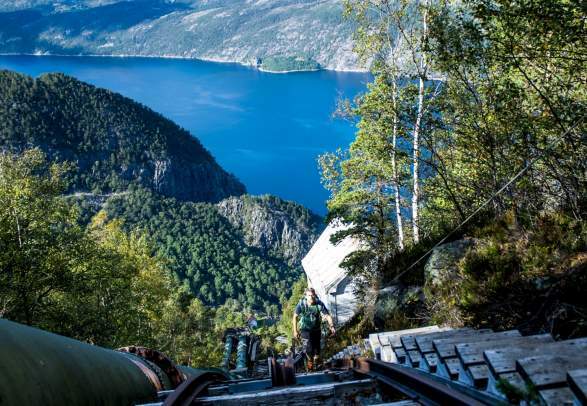 For example, it has a passage that is much narrower (only about 820 feet in some places) than its sources the Aurlandsfjord and the Sognefjord, and it is surrounded by steep mountainsides and flowing waterfalls. In the middle of this dramatic scenery you can see small, traditional farms and other dwellings in the hillsides along the fjord. , it stretches more than 200 kilometres into the country and measures 1,308 metres at its deepest point. The Sognefjord is also amongst the widest fjords and has numerous side arms far narrower than the main fjord. , it stretches more than 125 miles into the country and measures 4,291 feet at its deepest point. The Sognefjord is also amongst the widest fjords and has numerous side arms far narrower than the main fjord. of the fjords. Visitors are taken in by almost vertical mountainsides embellished with numerous waterfalls and topped by snow-capped mountain peaks that look like gigantic ice cream cones all year round. Three waterfalls are particularly well known: De syv søstrene (The Seven Sisters), Friaren (The Suitor) and Brudesløret (The Bridal Veil). The Geirangerfjord is the innermost branch of Storfjorden, and you can find it in the northern part of Fjord Norway. Rampestreken viewpoint above the city of Åndalsnes, and the hiking route across Romsdalseggen ridge. 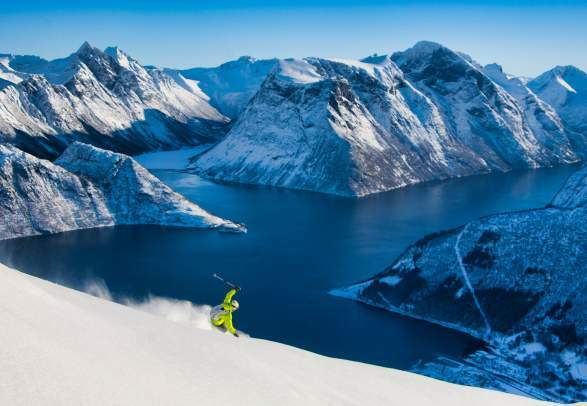 Another attraction is the mountain Kirketaket, which has been voted one of Norway’s top mountains for skiing. The expression “fjord view” most definitely does itself justice here. , but in the summer it is still frequented daily by cruise ships like Hurtigruten. In 2016, the Trollfjord got a lot of attention abroad when the American movie Downsizing, starring Matt Damon, was filmed here. 1. UNESCO has included the fjords of Fjord Norway, exemplified by the Geirangerfjord and the Nærøyfjord, on its prestigious World Heritage List. 2. The fjords are often described as “nature’s own work of art”, formed when the glaciers retreated and sea water flooded the U-shaped valleys. 3. Gudvangen and Geiranger, the two innermost villages of the Nærøyfjord and the Geirangerfjord, are amongst the most popular cruise ship ports in Scandinavia. 4. Thanks to the warm Gulf Stream and air currents caused by the coriolis effect, the Norwegian fjords enjoy a relatively mild climate and remain virtually ice-free. Seals, porpoises and different fish swim in the fjords, whilst eagles and other birds soar in the skies above. 5. The fjords are often very deep, and the Sognefjord is the deepest as it drops 1,308 metres below sea level. Because the fjords are so deep, they permit navigation by large ships, allowing you to experience their beauty at close range. Arriving in Fjord Norway by train is a scenic experience and is often an easy way to access the fjords (except in Northern Norway). The traditional coastal express Hurtigruten calls at ports all along the coast of Fjord Norway. Both short and more extensive guided tours are offered at most cities and places, and are effective and rewarding ways to explore the landscapes. Electric driven ferries and other ferry services operate all year round. Tunnels and bridges tie Fjord Norway together and make travels by bus, caravans and cars easy. Some bigger cities have national and international airport connections. 2. The fjords are often described as “nature’s own work of art”, formed when the glaciers retreated and seawater flooded the U-shaped valleys. 3. Gudvangen and Geiranger, the two innermost villages of the Nærøfjord and the Geirangerfjord, are amongst the most popular cruise ship ports in Scandinavia. 4. Thanks to the warming Gulf Stream and air currents caused by the Coriolis effect, the Norwegian fjords enjoy a relatively mild climate and remain virtually ice-free. 5. The fjords are often very deep, and the Sognefjord is the deepest as it drops 4,291 feet below sea level. See our selection of trusted companies that work hard to make you happy.